Food, rides, activities, entertainment for the whole family! All proceeds from this event support our school. See photos from the 2012 Duke Fun Fair on the Snap Beaches site. This entry was posted in Duke of Connaught Public School, Event on May 31, 2013 by The Ashbridge's neighbourhood. I am a volunteer for the Canadian Power & Sail Squadrons, a non-profit local & national organization and would be awesome to see everyone at our event this coming Thursday (May 30th) evening. Join us – the Ashbridge’s Bay Canadian Power & Sail Squadron (CPS-ECP, a non-profit organization) is celebrating 53 years of teaching safe boating! To celebrate the Ashbridge’s Bay Squadron will be participating in the CPS-ECP National Flag Relay Event on Thursday, May 30, 2013 at 7:30 pm. See details below. CPS-ECP’s first squadron was formed in 1938 by three Canadians in Windsor, Ontario and has grown across Canada to become the largest organization of its kind in the world with over 26,000 members in 155 squadrons. CPS-ECP is also the foremost educational boating authority in Canada. Every year thousands of members volunteer their time to teach safe boating courses, develop training material, host events, offer vessel courtesy checks for boaters and manage the organization. Why? CPS-ECP members have a passion and love for the water and enjoy sharing the boating lifestyle with others – a strong sense of community, with each squadron offering something special and unique to all boaters that congregate around the docks and marinas they call home. To celebrate its National 75th anniversary, CPS-ECP has organized a National Flag Relay across Canada! Two special commemorative flags have started their journeys across Canada on May 5th from where it all began – Windsor, ON. One will go east to Avalon, Newfoundland and the other going west to Vancouver Island, British Columbia. To symbolize how CPS-ECP has touched every major waterway in Canada, dipping ceremonies will take place at each stop at each Squadron from coast to coast. CPS-ECP has another good reason to celebrate: we have taught close to 1 million people safe boating from coast to coast in the last 75 years! This entry was posted in Ashbridge's Bay on May 28, 2013 by The Ashbridge's neighbourhood. Come join Applegrove’s Summer Adventure Day Camp. Our day camp runs weekly from July 2nd to August 23rd, 9 am to 5 pm, Monday to Friday for children ages 6 to 12 years old. We will provide weekly activities such as crafts, cooking, workshops and weekly trips! Our fees are $75.00 per child per week ($15.00 non refundable deposit per child. Limited subsidy is available). We are located in the Duke of Connaught Public School at 60 Woodfield Road. For more information please visit www.ApplegroveCC.ca or call our office at 416-461-8143. This entry was posted in Applegrove Community Complex, Duke of Connaught Public School on May 23, 2013 by The Ashbridge's neighbourhood. On Monday night at Ashbridge’s Bay, Toronto Star photographer Lucas Oleniuk shot a series of double exposures of the Victoria Day fireworks display. And see the Comments section on the previous post for a video of the fireworks – thanks for the creative response. This entry was posted in Ashbridge's Bay, Beach / Beaches, Event on May 21, 2013 by The Ashbridge's neighbourhood. The City of Toronto will host a sparkling display of Victoria Day fireworks at Ashbridge’s Bay Park starting at 10 p.m. This year the City will be featuring a combination of over 2,000 fireworks complete with a spectacular finale! This entry was posted in Ashbridge's Bay, Beach / Beaches, Event on May 17, 2013 by The Ashbridge's neighbourhood. Applegrove Spa Night — See the Applegrove Spa Night page. And on Mondays at lunch time, you can support Applegrove at Rakia on Queen at Vancouver – Rakia donates part of what you spend on Monday lunch to Applegrove. Also: Applegrove has a book club for people 55+. See the Applegrove Older Adults page for contact info. Applegrove Community Complex’s Older Adults (55+) Program is delighted to host “Book Talk — The Joy of Reading,” a month long book series run by Jones Public Library during the month of May. · Some recent fiction and non fiction books that will hook you for the first page and keep you going from there. · Readings from the books to get a feel for the authors and their styles. · Quotes from recent reviews. · Opportunity to immerse yourself in the world of good books and look forward to reading them. 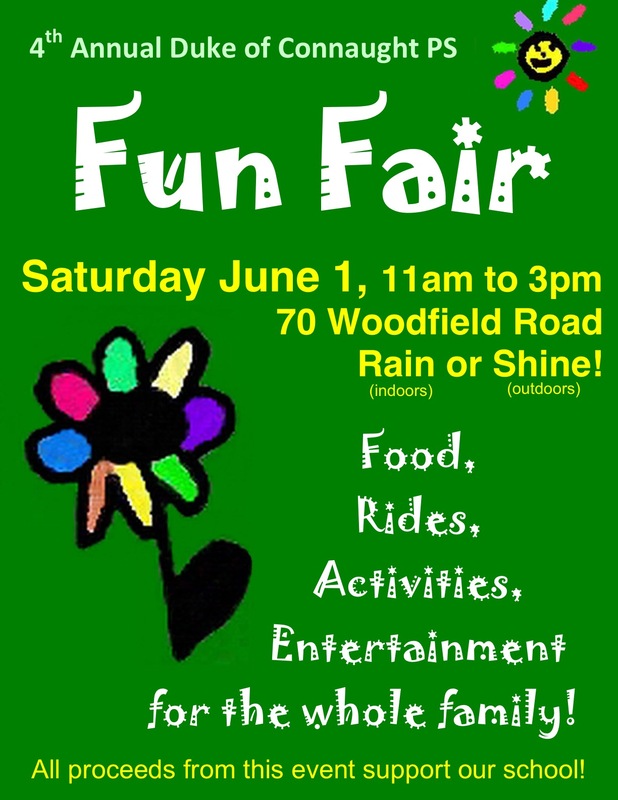 This entry was posted in Applegrove Community Complex, Ashbridge's neighbourhood businesses, Event on May 15, 2013 by The Ashbridge's neighbourhood. Deadline is today to file objections to Rakia application for a liquor licence (patio). E-mail is licensing@agco.ca as shown on the poster (see below). And on Mondays you can support Applegrove at Rakia on Queen at Vancouver – they donate part of what you spend to Applegrove (Monday lunch). 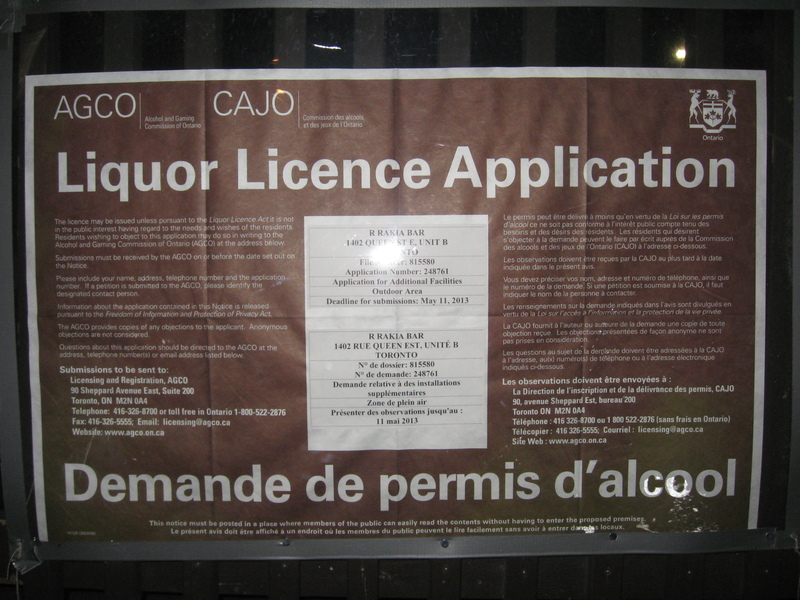 Noticed that Rakia is applying for a liquor licence for their patio – see below. Also noticed that a temporary principal is in charge at Duke of Connaught — welcome back Mr. Laderman while Mr. P. is away. This entry was posted in Applegrove Community Complex, Ashbridge's neighbourhood businesses, Event, Leslie Spit on May 11, 2013 by The Ashbridge's neighbourhood.